James Lawless said commuters can’t get parking at the train stations and can’t get on carriages in the morning. KILDARE TD JAMES Lawless says he has extended an open invite to Transport Minister Shane Ross to join him in making his way into Dublin by public transport from the commuter belt. Speaking to reporters today, he said commuters are “fighting their way” into Dublin every morning. Lawless said commuters in Kildare can’t get parking at the train stations and can’t get on the carriages in the morning. The Kildare North TD said he recently invited the minister “to come with me to Sallins to travel into Dublin to see how he finds a parking space, see how he finds the train, see if he can get on the Luas when he gets into Heuston Station. My experience is he wouldn’t be able to do any of the above”. Lawless said it is an open invite until Christmas. He said the housing bubble is expanding and forcing more people into the commuter belts like Kildare, Wicklow and Meath. “People are expected to get into work and into Dublin,” he said. “If we ran buses and trains on time and with capacity we can sort some of these problems,” he said, adding that he is concerned the government is yet to invest in train carriages. The minister has said in the past that the government is committed to supplying more train carriages. “The procurement process for additional DART fleet is expected to commence this year, with the contract for approximately 300 new rail carriages expected to be awarded in the second half of 2019. Some 28 refurbished carriages are to re-enter service in 2019, and this will add capacity to a number of services,” he told the Dáil recently. 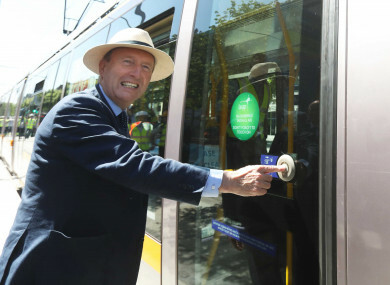 Email “Fianna Fáil TD invites Shane Ross to travel with him on public transport to Dublin from the commuter belt ”. Feedback on “Fianna Fáil TD invites Shane Ross to travel with him on public transport to Dublin from the commuter belt ”.